India is truly an incredible place – if not for the sheer spectacle, but for the minutiae. Jennifer and I were waiting for our car to take us from our ashram at Rishikesh to the airport at nearby Dehradun. The car pulled up outside, it was raining – monsoons – and the driver hopped out to help us with loading our bags in the back. The driver was a young man, I guess in his early 20’s, and he went to open the back door. But he noticed that there was a tiny itsy bitsy spider on the door handle. In fact it was dangling just below the door handle, by a thread of its own making. It was pouring with rain, the driver was getting soaked every second he stood by the car – but even so he tried to flick the spider away from the handle so that he could open the door without in any way harming this tiny insect. The spider didn’t want to go. It must have been nesting in the handle, because it resolutely refused to be flicked away. Again the spider clung on. By now the driver was almost soaked to the skin, principally because he didn’t want to hurt this itsy-bitsy spider. Anyone else most probably would have thwacked the damn thing and squashed it flat, opened the door, slung the luggage in and got out of the rain. He persevered until the little creature was safely out of harm’s way, then he opened the door. In the flurry of leaving the ashram, in very heavy monsoon rain, it was a moment that would have gone unnoticed, except I noticed it. To me it said so much about that young man, and what he values. 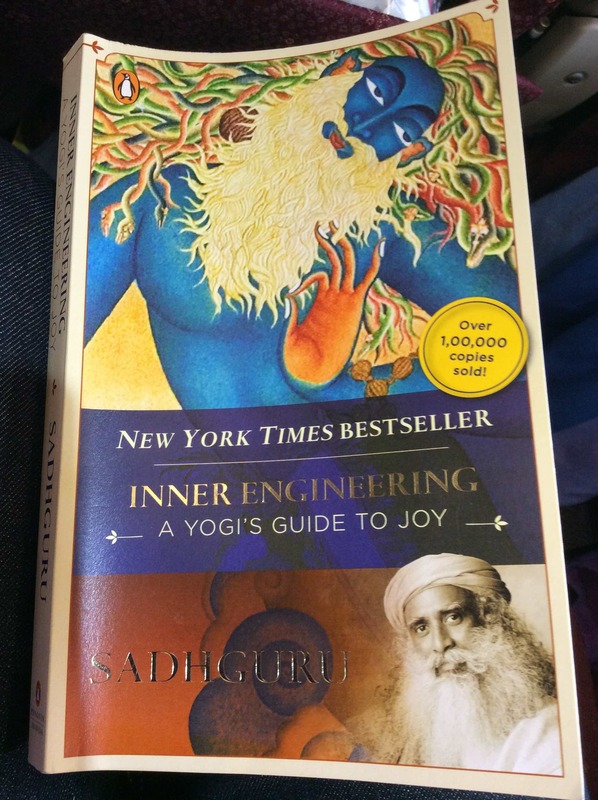 At the airport bookstore in Bombay I was drawn to a book by a Yogi Master named Sadhguru. I don’t usually buy book books now, I usually read Kindle books. But this one stepped forward and said Buy Me, Buy Me. It was called INNER ENGINEERING – A YOGI’S GUIDE TO JOY. I started reading it in the terminal waiting for the flight to Sydney, and almost finished it by the time we landed. I know now why it screamed out to me to read it – it’s a very important book for me right at this moment. It’s less about joy and more about what’s important in life. There has been a tradition among many women folk. An ant is the smallest living entity you can see around you, the most inconsequential organism you can think of. So, for that very reason, you feed it first, before you feed yourself. You make an offering not to the Gods, or other celestial creatures, but to the smallest creature you know. This planet belongs as much to them as it does to you. You understand that every living creature on this planet has the same right to live as you have. This awareness can help create a conducive atmosphere, mentally and physically, for consciousness to grow. So there you have it – feed the ants and don’t smash the itty-bitsy spiders! Hi Bill, I LOVE this post. I think I will check out this book, too. I am 50-50 when it comes to small insect-critters being where they don’t belong, but I’m getting better as I get older, about it, though (we have a special item set aside to catch spiders or other small “visitors” in our house.). That young man sure gave an example of love and respect for nature in spite of the pressure he might have felt he was under at that moment – this was his priority, respect and love for all creatures of the world. The story of the Indian tradition of feeding the ants is cool, too. Thanks for this, Bill, once again your writing brightened my day!